What can I measure with the fluid-Check Leakage sensor? Seal damages and leakage identification. A single hydraulic leak of one drop per second is equal to 420 gallons of oil in a 12 month period. Multiply 420 gallons by the current price and it's clear that it isn't worth it to let the problem continue. In addition to the cost of the lost oil, other machine parts can be damaged if the leak is severe. The leakage sensor fluid-Check® is ready to be use and will be programmed by BOLENDER-Germany according necessities of the client in liters or gallons per minute. It is based on the calorimetric principle, that means the sensor head has an intern thermo element and heating where the running oil temperature will be measured. The measuring cycle takes 3 seconds. The sensor head temperature raises at 2°C. The time for this will be measured and the flow rate will be calculated. The needed time for measuring is 15 seconds. The special on this “made in Germany” product is not only the easy installation of 5 minutes- no cutting pipes and without contamination with an Allen wrench. 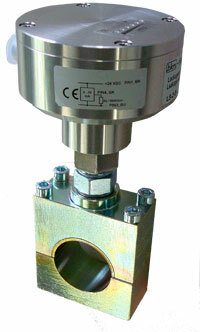 The hydraulic operator gets with the fluid-Check® sensor and the measuring connection serv-Clip® with ¾” screw that opens a wide choice of measuring devices because one can deinstall the fluid-Check® and install at the same point sensors or manometers for measuring temperature, pressure, etc. You get pro sensor a data sheet with curves (comparison mA with liter/min or gallons/min).